Teachers and staff involved with the new TechActive Classrooms of Tomorrow are exploring the new possibilities for their courses. Over the summer, classrooms in Building 12 were made into Classrooms of Tomorrow, a countywide middle school initiative led by Executive Director of Middle School Education Dr. Page Dettmann. Classrooms of Tomorrow have been added to Sarasota County middle schools over the past three years. “We’re really excited to bring this environment to Pine View,” Assistant Principal Janel Dorn said. Dorn has experience working with similar programs, as she previously worked as the project manager of Sarasota High School’s Technology Enabled Learning (TEL) studios, the high school-equivalent technology initiative. The new classrooms each include six student stations with rolling chairs and 27-inch touchscreen computers at each station. 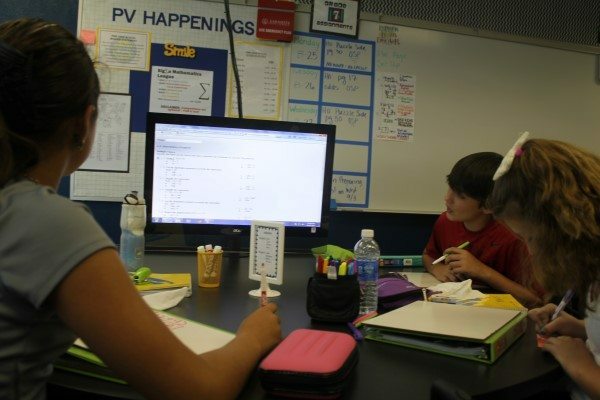 A single teacher station, allows teachers to use an ActivBoard and computer to teach students, as well as to project images onto each of the student computers. Students can interact with flipcharts, PowerPoints and other activities that teachers broadcast to each station. TI-Nspire calculators, digital probes, microscopes and measuring equipment such as scales and balances are also available for use at the stations. The TI-Nspire graphing calculators allow teachers to store documents for students to open and read, create calculator-based assessments and collect data to evaluate how each of their students is performing. Teachers with the new classrooms include science teachers Beverly Templeton, David Yotsuda, Marybeth Torres and Tonya Johnson, as well as math teachers Tara Spielman, Steve Folts, Rory Kaminske and Summer Grantham. The new classrooms have changed how students interact, with greater emphasis on peer collaboration. “It helps build a sense of community in the classroom,” Spielman said. Spielman uses rubrics for her students to evaluate their own work as well as their peers’ work on activities, while she uses a checklist as she observes how students cooperate in their groups. “It’s a lot more interactive this way… we can all interact and collaborate better,” seventh-grader Kemper Bernstein said. Students have a greater responsibility to be engaged in the learning process. “I see it really helping students to better focus them on the lessons,” Yotsuda said. For some teachers, the new technology has necessitated new teaching styles. Templeton had students watch a science podcast and develop a flowchart on their group computers in order to learn about the scientific method. Grantham’s geometry classes are working with geometry programs to create graphs that they were previously only shown. The new technologies coincide with updated Common Core standards, one of which encourages more literacy, even in math classes. Teachers attended training sessions at Venice High School Aug. 6 and 7, but the classrooms at Pine View were not operational until Aug. 15 due to the absence of power cords for the computers. Since then, teachers have familiarized themselves with the new technologies and collaborated with one another. “I totally am blown away by the dedication of the eight teachers that are in there,” Dorn said.